Tara felt distinctly uneasy as she waited inside her gate for the semi-finals of the 2007 Jeep King of the Mountain bike race to start. She didn’t feel ready. Her pedal didn’t feel like it was in the right spot, her goggles didn’t feel like they were sitting right… It was like some sort of premonition. Her competitor Jill took the lead but Tara caught up when Jill crashed. But on the next jump, Tara ‘botched it’. There was so much force, that Tara broke her neck, and her back. 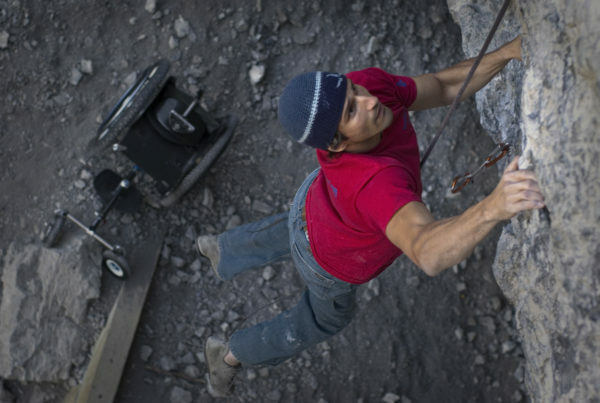 ”I came to a dead stop and then my body rolled back down the lip of the jump, and my legs, it’s like I could feel them, but they were disconnected from my body. The hardest thing about Tara’s recovery was not the lengthy rehabilitation process – it was going home to California, where she fell into a dark place. Despite sharing an accessible house with her partner she just felt so desperately alone. Fortunately, Tara discovered physiotherapy organisation Project Walk – a pioneer in activity based recovery and this forced her to be physical again. That’s probably Tara’s number one piece of advice – keeping active. That and using a standing frame to help blood flow and keep limbs active which would normally be sitting stagnant in a chair. Project Walk also gave her the opportunity to meet people she could talk freely too. 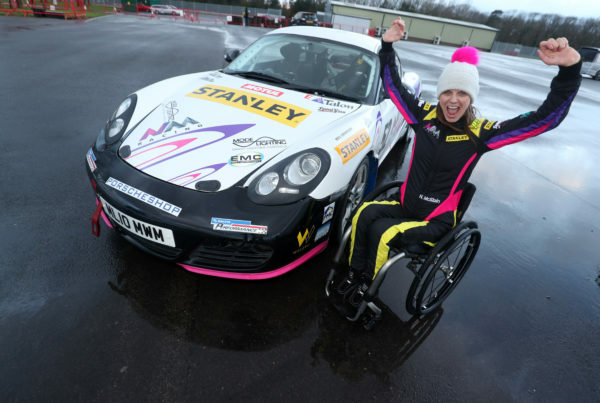 Tara was also supported by the Challenged Athletes Foundation (CAF) who gave her a handcycle and an assisted race chair to get her back into racing, albeit in a seated form. Tara found doing anything again for the first-time post-accident really difficult. About a year after the Jeep King of the Mountain race she attended a mountain bike festival. Despite the pain Tara made a habit of going and putting herself in those uncomfortable situations as much as she could because over time it gets easier the more you do. Not long later she met Aaron Baker, who had been in a chair for 10 years and was wise beyond his years. Unfortunately Tara fell back into a dark place again after making the move from California to Canada where she knew no one and the pain meds she had become dependent on had a menacing grip on her life. Once again sport and meeting other wheelchair users saved her. This time wheelchair tennis lessons opened up a whole new world. ”It was incredible, I realised that I could be a high level athlete again, and there were opportunities, if I wanted to try to go to the Paralympics. Tara turned her life around, stopped taking the pain meds and after three years made it to the national tennis team. She is now also paid to play in the Canadian national wheelchair basketball team – her sights set on making the 2020 Tokyo Paralympic team. Tara admits that being outdoors is what she really loves – and what better way to enjoy it than mountain biking – adaptive styles of course. 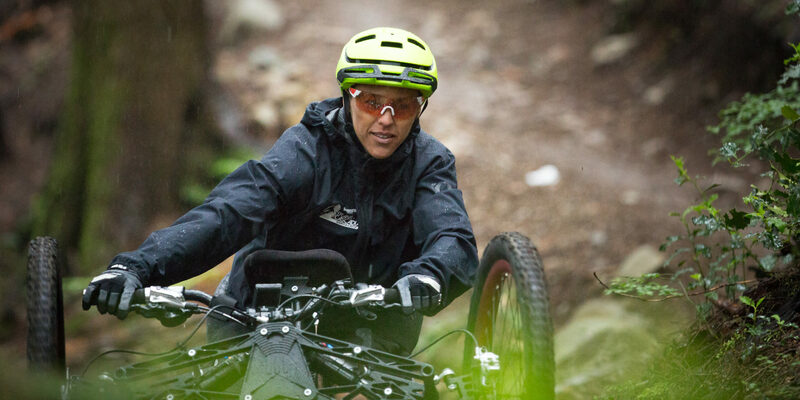 Tara’s company Tara Llanes Industries sells specialist adaptive mountain bikes, and she is actively working with communities to build adaptive trails and build the sport up. If you want to rent one while in BC, Canada hit her up. And changing lives Tara is. Ride well Tara, best of luck with your sport, and keep on adaptdefying! Listen to the Podcast with Tara Llanes now.